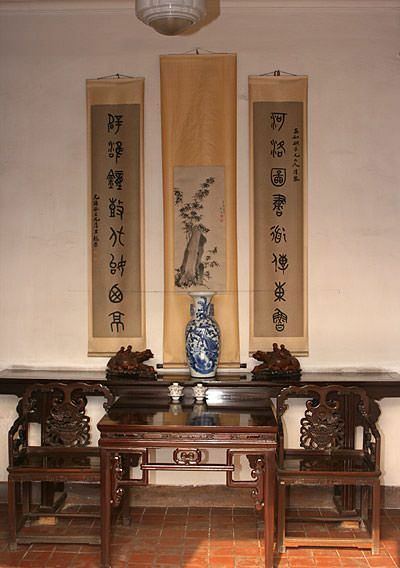 Artwork Panel: 52.5cm x 93.5cm ≈ 20¾" x 36¾"
Silk/Brocade: 61.5cm x 152cm ≈ 24¼" x 59¾"
Width at Wooden Knobs: 70.5cm ≈ 27¾"
This wall scroll features Confucius, whose real name is (Kong-Zi). His family name is "Kong", and the "Zi" is a title of distinction (especially used in ancient times). 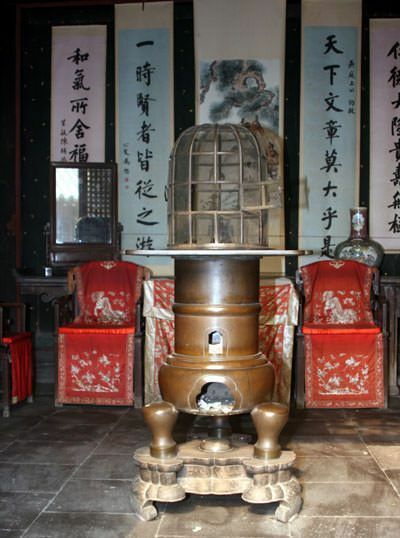 Many in China still claim to be members of the Kong family, or at least distant relatives of Confucius. However, when the Cultural Revolution was about to begin, and Chairman Mao was taking power, virtually all members of the Kong family fled to Taiwan, never to return. 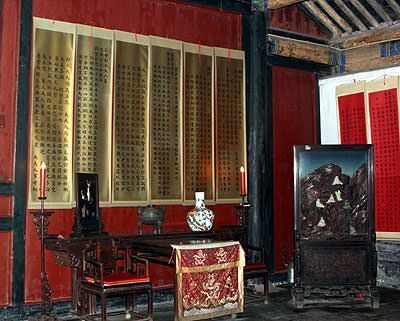 You can still visit the home of Confucius in Qufu, which is in Shandong Province of Northern China. It's a huge compound that had its own army, and status of a state within a state, much like the Vatican in Rome. The Kong family once wielded great influence, and even dictated that the train tracks be laid outside of Qufu city, as to not disturb the slumber of Confucius in his grave. Even today, it's a long taxi or bus ride from the nearest train station to the Confucius compound. 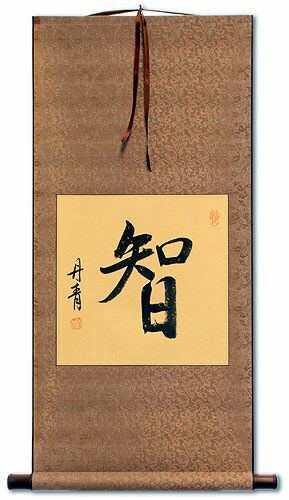 Please note that the xuan paper used for the painting on this wall scroll may have some embedded fibers, husks, or specks. This is not a defect, but a natural part of this handmade paper. Here is Sandy holding a different wall scroll by Jin Bin. This one is actually about 122cm or 48" long (smaller than most of the Jin Bin wall scrolls we sell). Even in this smaller size, it shows you how big these handmade wall scrolls are. This is a very detailed painting that is mounted to a silk wall scroll. A lot of work went into this. It actually takes the artist about a half day to complete. The artist's name is (Qing Jing-Bin). He was born in Guanxi Province (southern China). 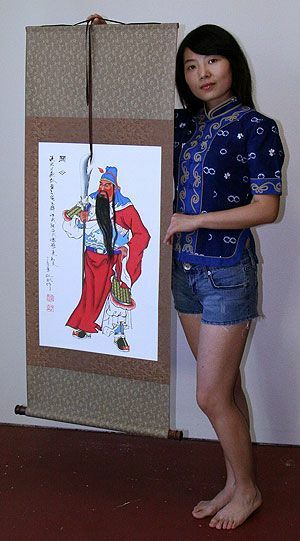 His specialty is paintings of mythological and historical figures of ancient China. The wall & gate surrounding the hometown of Confucius. See also the golf cart, er, I mean police car on patrol. Unable to get a train ticket to the next city on my art-buying journey, I realized that I'm in Shandong, which is also holds the ancestral home of Confucius. 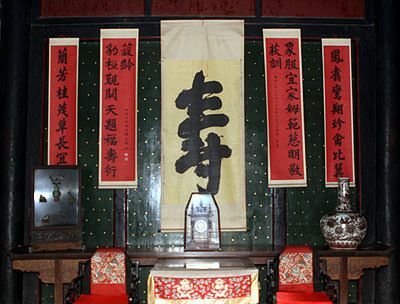 The name of the city that claims the title as the birthplace and home of the Great Sage is Qufu (pronounced like "chew foo"). I arrive at a train station that seems far from the center of Qufu, and with good reason... When train tracks were being laid in China for the first time, the descendants of Confucius (a family that had great influence and respect) demanded that the tracks be laid far from the family home. 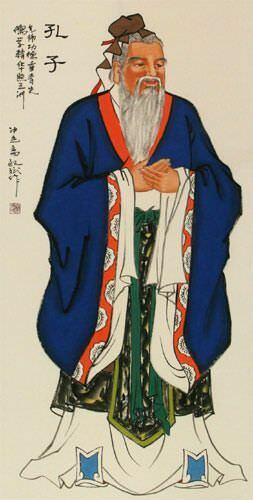 The reason given was that the vibrations of the trains might bother the resting Confucius in his tomb. Thus, the nearest train station is roughly 10 kilometers outside of the city. There is also no airport anywhere near Qufu, so your desire to visit Confucius must be enough to overcome the travel obstacles. Qufu is a little different than other cities in China. My feeling might come from the more quiet nature of Qufu, or the fact that the bicycle taxis in Qufu are a funky front-loading style, rather than the typical rear-passenger seat tricycles in other cities. 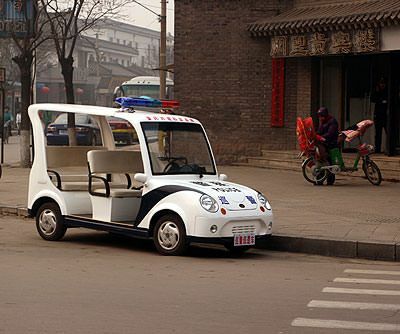 Also, the police in Qufu drive around in electric cars. 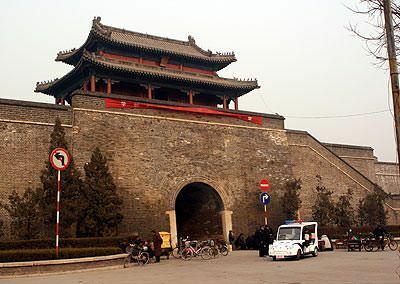 The ancient portion of the city is surrounded by a high wall and gate system - like the one that surrounds Xi'an and used to surround Beijing (Peking) before they tore it down 50 years ago. 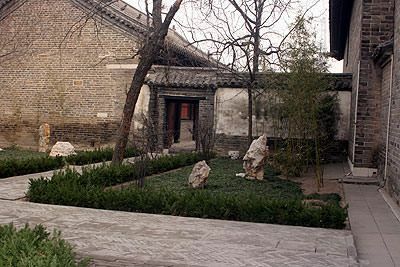 The Confucian compound takes up most of the space inside the main wall, and that compound is also surrounded by a wall. The whole place had the status of being a state within a state, with its own small army of guards, and diplomatic representatives that met with officers of the Emperor's court, and even the Emperor himself. The compound can be compared to the Vatican in Rome, with its special status, and history of advising leaders on matters of ethics and philosophy. Are you seeing a theme yet?. 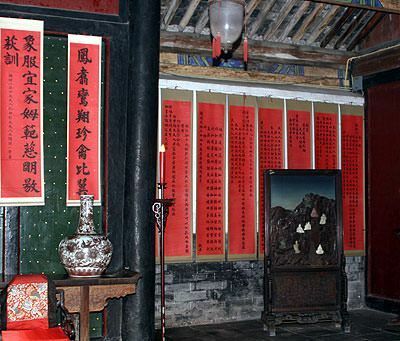 In the home of Confucius, virtually all rooms have wall scroll depicting various philosophies, tenets, and writings of Confucius and other sages. A true Chinese garden, this one belonging to Confucius. This style of garden was later used by Japanese who absorbed both the tenets of Confucius and this type of garden arrangement. 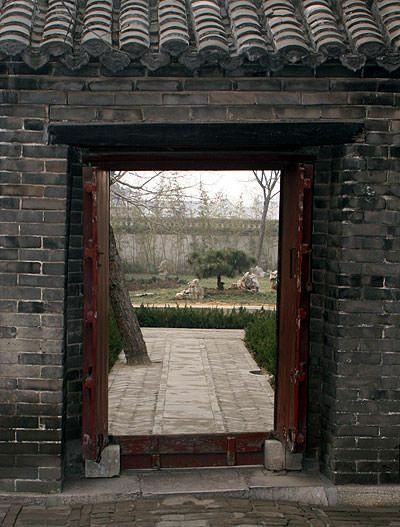 A door that leads to a garden in the Confucian compound. 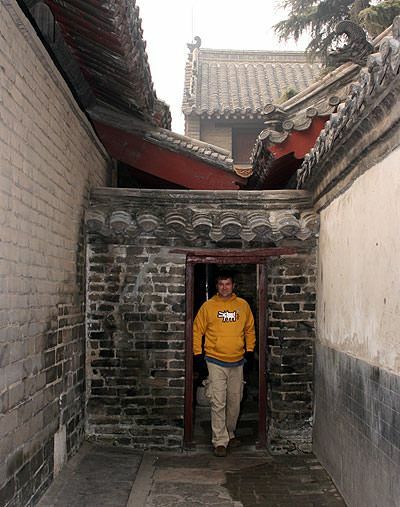 The Confucian compound is like a maze, here I am lost in the labyrinth. 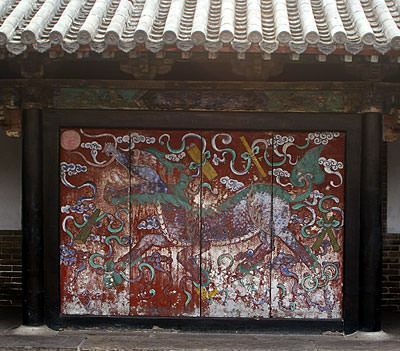 This mural is of an animal that might be a Qilin (Kirin) but some characteristics of a dragon or lion as well. This is the "beast of greed" who grabs everything and every treasure in the world, but it never satisfied. This mural is placed where all members of the family of Confucius are forced to look at it when they leave the compound. It is to remind them that greed will only lead to misery, and benevolence should instead prevail. Things are pretty mellow in the hometown of Confucius. Police patrol the town in this glorified electric golf cart. Even the hometown of Confucius is getting commercialized. Here a total knock-off of Kentucky Fried Chick has opened. 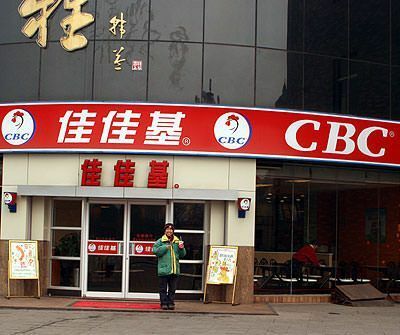 The CBC stands for "China's Best Chicken".